Raise one worker and equipment up to 21' working height. Enclosed platform with 42" guardrails, midrails, gate, toeboards and skid resistant deck. 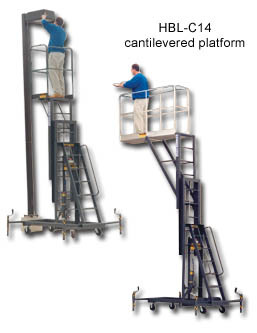 Build-in ladder with flat skid-resistant treads and grab rails provide access to platform. Self-storing outriggers provide maximum stability. Leveling jacks secure unit to floor. Rails fold for doorway passage. A cantilevered model is also available to provide safe access to hard-to-reach locations. These units have a lifting capacity of 300 lbs. 6" casters for easy rolling and maneuverability. Hydraulic system includes a dual-action hand pump. FOB Shipping Point. Platform Duplex ReceptacleOptions available ... see individual part numbers for availability and pricing (not all options available on all part numbers). Product No. Platform Ht. Max. Platform Ht. Min. Wt. (lbs.) Platform L x W Price Ea. HBL-315 15'	 6' 4"	 590	 20 x 28"
HBL-C14 14'	 6' 4"	 900	 64 x 20"